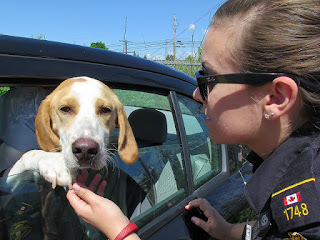 As the weather warms, the number of calls you make to us about dogs in hot cars soars. What should you do if you spot a dog locked in a hot car? Just remember T.A.N. 1. Take information. Note the make and model of the car, the license number, exact location, and a description of the dog: breed, colour, size. etc. Remember that windows cracked open do not significantly reduce the internal temperature of a car. 2. Assess the situation. How long have you been present while the dog has been in the car? Is the dog in distress? Signs of heat distress include excessive panting with the tongue fully extended, stumbling, glazed eyes, disorientation, hiding in the footwell, and ultimately, coma and death. 3. Notify authorities. Contact nearby stores and businesses. Ask them to make an announcement for the owner to return to their car. If the dog is in distress, call 911. Stay on the scene to monitor the situation until the owner or help arrives. Please know that citizens are not protected from litigation if they cause damage to enter a car, even if it is to rescue a dog in distress. And of course, don't be a part of the problem. Don't leave your pet in a hot car. Heck no, I won't go.